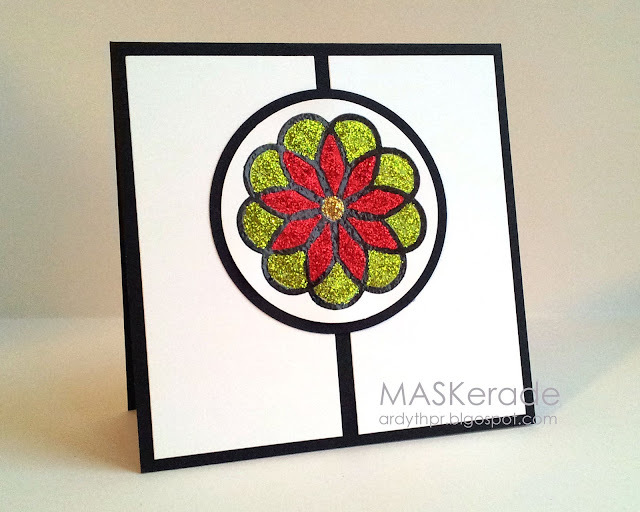 and this week's Less is More challenge, which is also to use green and red. And then it started raining. And it didn't stop, so there was not much light for this photo. OMG! This looks like stained glass...it is just as beautiful as your stained glass window that you shared with us a while back! And (blush, blush) thank you so much for your kind words! You did an amazing job with this sketch. Clean, simple & perfectly neat & tidy - love it! You are the queen of Stickles Ardyth! I can never get to results that you do. Jaw dropping! Such a striking card! Glad you could join us at Dynamic Duos this week! Oh my goodness Ardyth. This steals the show. I literally gasped when I saw it. Wow. This is really dramatic Ardyth, super job! Gorgeous! I love all those sparkles! Too bad there isn't a way to add a ton of dimensional glaze to this and create a broach, belt buckle, something! It's really stunning!! Stunning card love the glitter and colors. Thanks for joining us this week at Unscripted Sketches. Hope to see you next week. Pick me up off the floor! You've floored me with this one, using the graphic flower as a Poinsettia - GENIUS! LOVE LOVE LOVE the stickles too! Totally fabulous card! Love the graphic flower and your stickles!Thanks for playing at Unscripted Sketches! I love your card!It's stunning! I just LOVE this card. The stickles were the perfect touch. You have such a cute blog... Thanks for sharing your take with us at Unscripted Sketches. So cool - it's like a stained glass window!